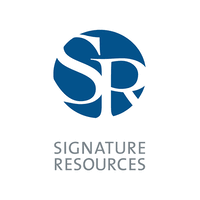 Signature Resources Ltd. (TSX-V: SGU) (OTCQB: SGGTF) reports the results of drill holes 18-03, 18-04 and 18-05 which targeted the North Zone at the Company’s Lingman Lake gold property located in northwestern Ontario. This year’s exploration campaign was conducted with a view to test the grade and continuity of the mineralization encountered in historical drilling done on the property by previous operators. Highlights from the North Zone drilling are summarized below. Drill hole 18-05 returned 8.0 meters with an average grade of 17.87 grams of gold per tonne (from 95.0 to 103.0 meters). True width is estimated at ~6.9 meters. Drill hole 18-03 returned 4.0 meters with an average grade of 6.84 grams of gold per tonne (from 82.0 to 86.0 meters). True width is estimated at ~3.5 meters. Drill hole 18-05 was collared to intercept the North Zone at approximately 64 meters vertical depth, in the gold-mineralized shoot between the 150 Level (45 meters vertical depth) and 275 Level (84 meters vertical depth) of the historical underground workings at the site. Historical drilling in proximity to 18-05 are: 45-21 (approximately 14 meters higher up and 5 meters east) assayed 136.5 grams of gold per tonne along 3.9 meters; and 87-73 (14 meters higher and 20 meters west) assayed 13.50 grams of gold per tonne along 9.2 meters. Drill hole 18-03 was collared 83 meters west of 18-05 and was designed to intersect the North Zone at 55 meters vertical depth, between the 150 Level and 275 Level. Historical drilling in proximity to 18-03 was hole 45-17, situated 11 meters lower which assayed 16.10 grams of gold per tonne along 3.02 meters. Drill hole 18-04 was drilled to test the grade of gold-mineralized shoots between surface and the 150 Level in an area previously untested by drilling. 18-04 intersected the interpreted edge of a gold-mineralized shoot of the North zone and returned an assay of 2.33 grams of gold per tonne along 6.0 meters, (5.2 meters true width) at 23 meters vertical depth. The above cited intersections for hole 18-03, 18-04 and 18-05 are derived from assay results presented in the following table and are reported as weighted composite averages. Notes: 1 North zone strikes east-west, dips 75° to the south. 2 UTM coordinates: Zone 15N. Datum: NAD 83. 3 Reported analysis is the mean of original sample (3.26 g Au/t) and duplicate sample (2.35 g Au/t) from same core interval. Gold analyses were performed using a fire-assay concentration with an atomic-absorption finish. Gravimetric-finish results of the highest-grade intervals are to follow. QA/QC results support the validity of the original assays. The Lingman Lake gold property, located in northwestern Ontario in the Red Lake Mining District consists of four free-hold full patented claims, 14 mineral rights patented claims and 1,054 single-cell staked claims, comprising a total of approximately 21,420 hectares. The property hosts an historical estimate of 234,684 oz of gold* (1,063,904 tonnes grading 6.86 g Au/t at a 2.73 g Au/t cut-off) and includes what has historically been referred to as the Lingman Lake Gold Mine, an underground substructure consisting of a 126.5-meter shaft and three levels of development at depths of 46 m (150 Level), 84 m (275 Level) and 122 m (400 Level).